The US government’s most recent broadband statistics from the FCC claims 25 million Americans to be lacking access to a broadband connection. However, Microsft did not agree and after conducting its own analysis found the number much higher at 162.8 million. The company says getting the number right is critical and warns there are fundamental problems with the data used for broadband mapping. 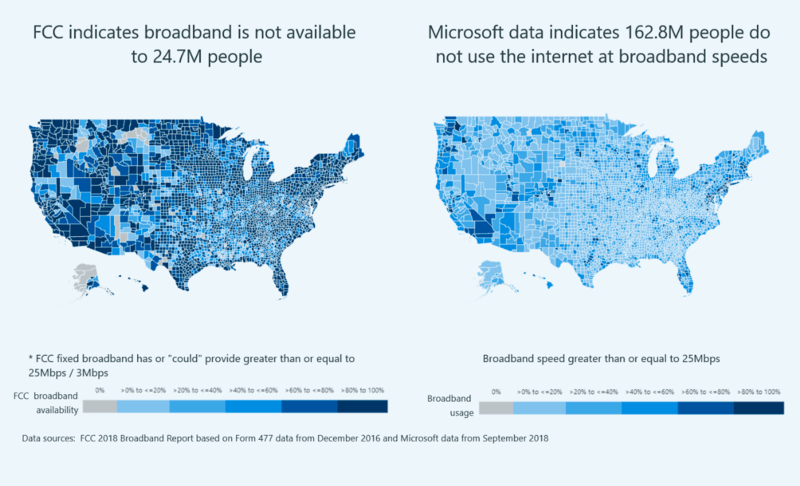 Millions of Americans lacking access to broadband have been made invisible," says John Kahan, Microsoft's Chief Data Analytics Officer. Consequently, he cautions, the oversight substantially decreases the likelihood of additional broadband funding or much-needed broadband service. — "Our results align well with the FCC’s broadband subscription data and the Pew Research numbers, which suggests these data sets are far closer to the mark than the broadband access data reported by the FCC and leaves us with the unescapable conclusion that today there exists no accurate, comprehensive and public estimate of broadband coverage in the United States." — "In our home state of Washington, the FCC data indicates that 100 percent of Ferry County residents have access to broadband. When we spoke to local officials, they indicated that very few residents in this rural county had access and those that did were using broadband in business. Our data bears this out, showing that only 2 percent of Ferry County is using broadband." The Senate Commerce Committee is holding a hearing on Wednesday titled "Broadband Mapping: Challenges and Solutions" to examine the issues at hand. Local Time: Tuesday, April 23, 2019 07:28 AM PDT – Page Load: 0.2820 Sec.